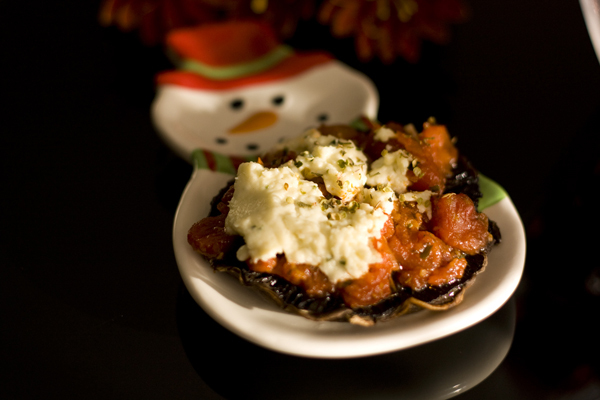 This is a version of a very yummy portobello mushroom appetizer recipe that our friends Keith and Vicki made this Christmas. It can also be used as a main dish. 1. Preheat oven to 375 degrees F and lightly oil a baking sheet. 2. Clean portobello mushrooms by brushing them with a wet paper towel. Remove the stem and discard. 3. Brush the mushroom caps with the olive oil. Place mushrooms on the baking sheet, facing upwards. 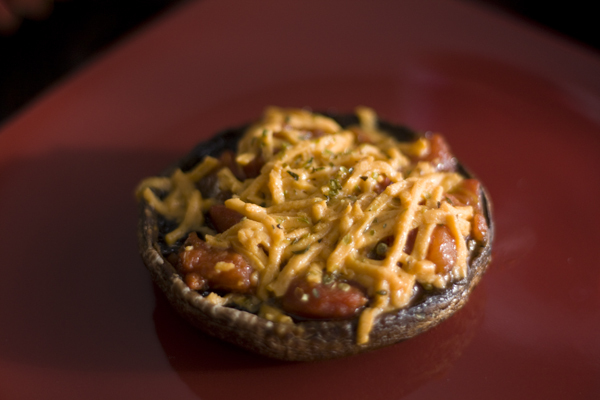 Sprinkle 1/4 cup bruschetta on each mushroom cap. 4. Bake for 13 minutes in the preheated oven. Remove from the oven and spread Boursin cheese or vegan cheese on top of the bruschetta. 5. Return the mushrooms to the oven and bake until the cheese melted and bubbly. Allow the mushrooms to cool for a few minutes before serving. For a vegan version, use 4 ounces of shredded vegan cheddar cheese. We used Daiya on the vegan one pictured below.